The proceedings of the day-long conference are 92 pages of single-spaced text typed on letter-size paper. This conference was held to investigate some of the following questions. How many California Condors are left? 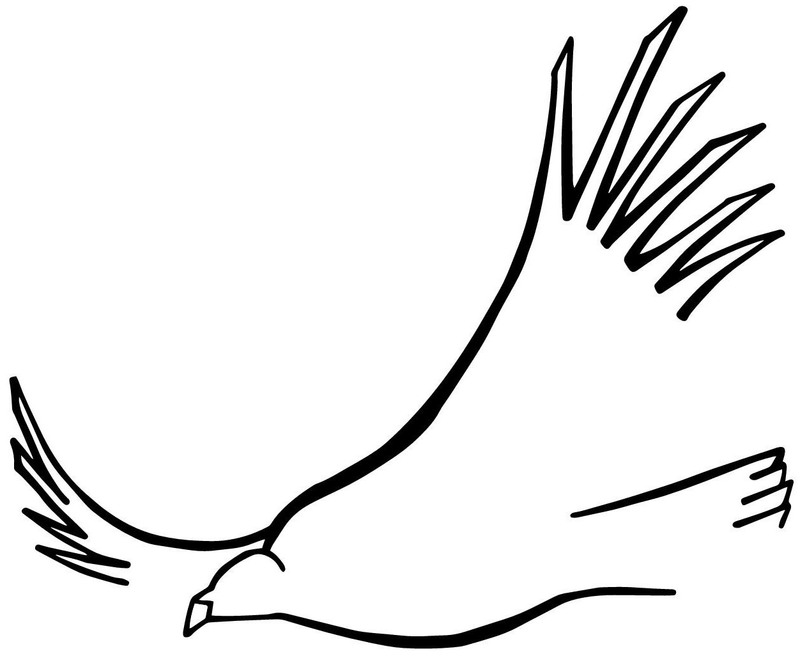 Are their numbers diminishing, increasing or remaining stable?… What are the effects of rodenticides and, or, hunting on the big raptor?… Should they be studied with “hands-on” research techniques …?… Should adult birds be taken out of the existing small population for use in a captive breeding program …? Should a different type of program be carried forth; one that uses a “passive” means of observation, and concentrates more heavily on preservation of the existing habitats …? Should we, as human beings, even further interfere at all, or is it, as some have suggested, time for the condor to become extinct? There is nothing else on earth exactly like the California Condor. If it vanishes we will be missing a very essential part of the fabric of our lives. We must keep asking these questions. We must keep doing what we can to preserve all the parts of the web. More than 160 people attended. Only a third of the attendees acknowledged having seen a condor in the wild. I am familiar with battles between the environmental-conservation community and the political and business communities, but I have never seen, as in this conflict, such arousal of severe problems within the environmental conservation community itself. This conflict, with its extremely emotional … drama, has blossomed … into what may be the most significant threat affecting the endangered California condor today. The next 3 presentations came from one side of the controversy: Ornithologists John Ogden, from the National Audubon Society, and Noel Snyder, from the U.S. 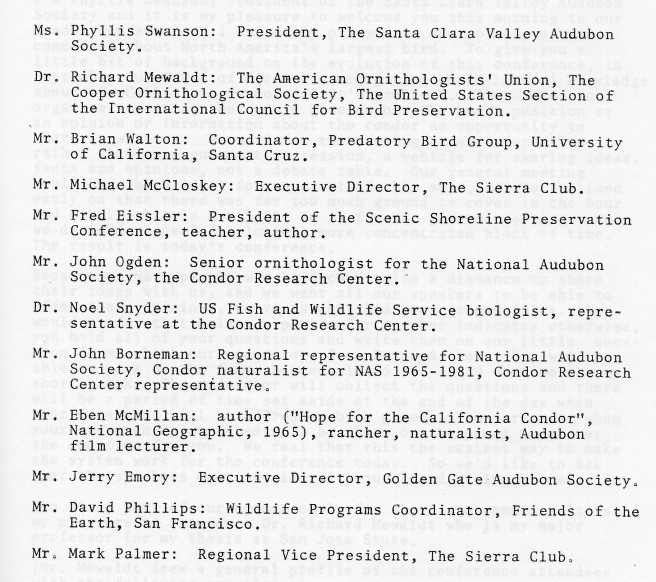 Fish and Wildlife Service, plus John Borneman, also representing the National Audubon Society. I think that there is no question that the over all goal of our research program is to maintain, if at all possible, a viable population of California condors in their native range. I feel a little odd having to say that, but in the last few weeks I have met with several groups who have wondered if that was part of our objectives. 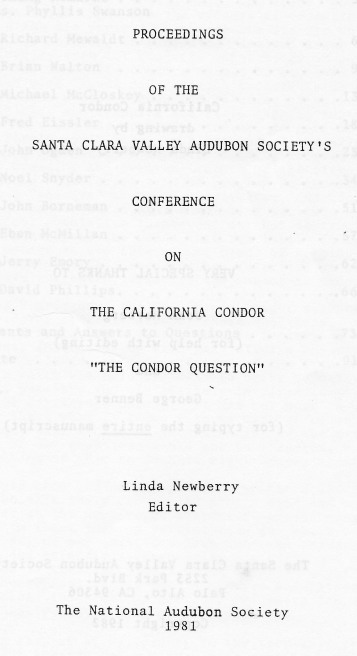 The presentations by Ogden and Snyder largely focused on their “hands-on” scientific research with condors and their proposals for further research and management. Borneman focused on the condor’s habitat needs and the threats to that habitat. Then the presentations shifted to those critical of the scientific study and management of the California condor. … it isn’t going to be the Audubon Society’s representative, or the Fish and Wildlife Service representative that are going to save the condor. It is going to be the people that are going to save the condor, because we are the only ones that will stay on the job when things get tough. We feel our concerns are legitimate and we offer them in good faith and with all the best intentions for the condor. By “invading, tinkering”, Brower meant handling, tagging, and the like. It’s a strong criticism of the condor scientists to equate their work with “poisoning, shooting”. The proceedings concludes with comments from the speakers on each others’ presentations and questions for the speakers from the audience. [Dorothy Lily] wants to know why we cannot try transferring some California condors to some place in the South American Andes where it is not so highly populated? In fact, Andean condors were later released in southern California to prepare the way for the release there of captive-bred California condors. For more on the controversy over how to “save” the California condor, see the posts Are nearly-extinct species “ruins”? and Let them evolve. The drawing of a California condor that Linda Newberry created for the proceedings’ cover is shown in the post Still more black & white illustrations from books: 1953-1991.